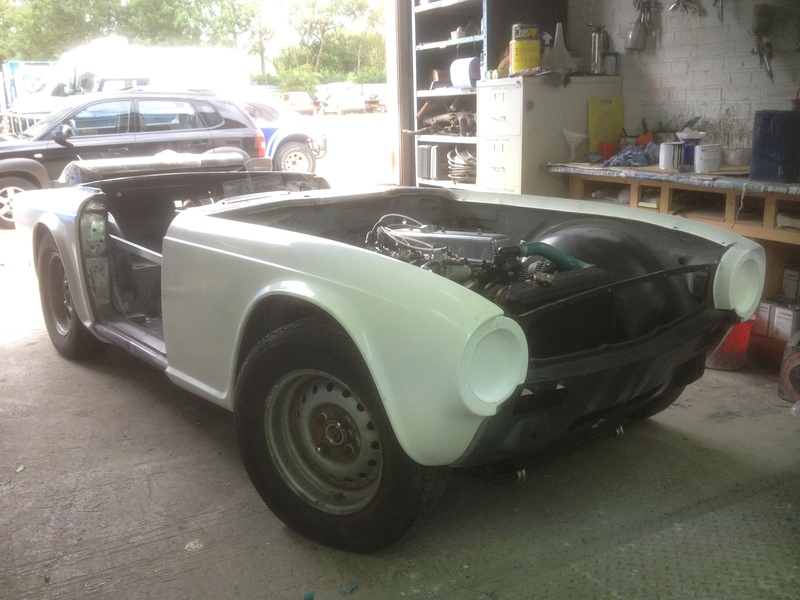 Andrew is a fantastic engineer and as a pet project has been rebuilding a Triumph TR6 for hill climb events inspired by the old group 44 cars. 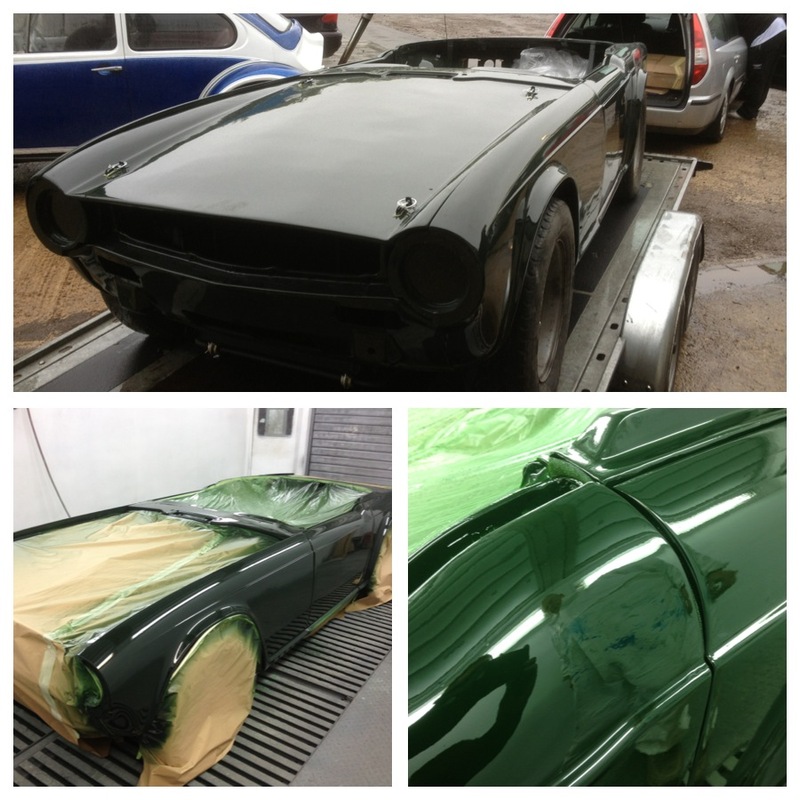 As Andrew’s TR6 was for hill climb racing his primary concern was function over form and so the body panels where to be GRP (fibreglass) for the wings, bonnet and boot lid whilst the doors where specially commissioned to be skinned in lightweight aluminium. 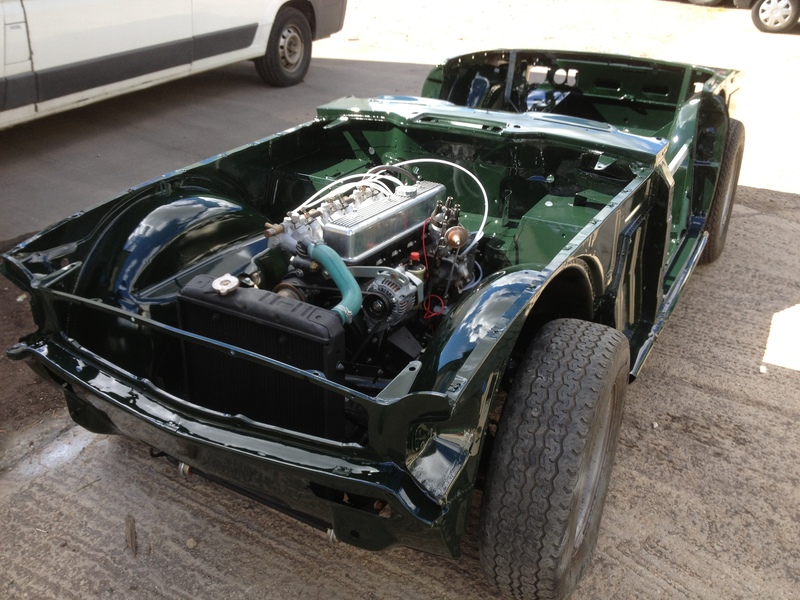 Comparatively speaking this TR6 was a straight forward job all the inner body and chassis had been welded and the outer panels where all new. 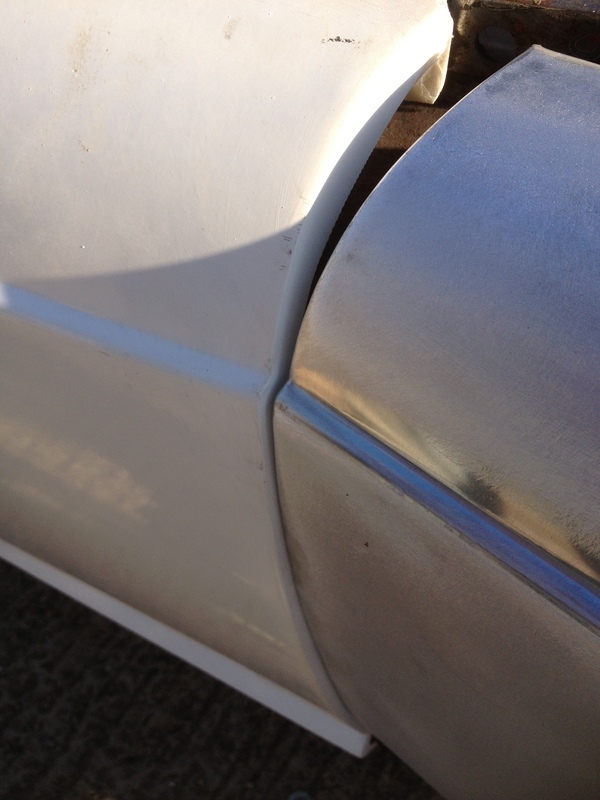 The only problems were; a dent in the sill panel, one wing was misshapen, ripples in the aluminium door skins from the pressing procedure and now way of securing the bonnet or boot to the car. So our first job was to modify the Triumphs GRP wing so the bonnet would fit in the gap however the bonnet was super lightweight and only made of Approx 3 layers of fibreglass which meant that it did not support it’s own weight and it was also a different profile to the wings and was immensely ripply from production. As the car was to be super lightweight this meant that it could not be smoothed out as extra weight would be added and sanding it flat where create holes. To modify the wings we first had to get the bonnet to sit aligned as best as possible between the front wings. To do this we made four brackets to permanently act as the bonnet fixing supports and two pedestal feet to apply pressure and bow the bonnet to meet the wing profiles. 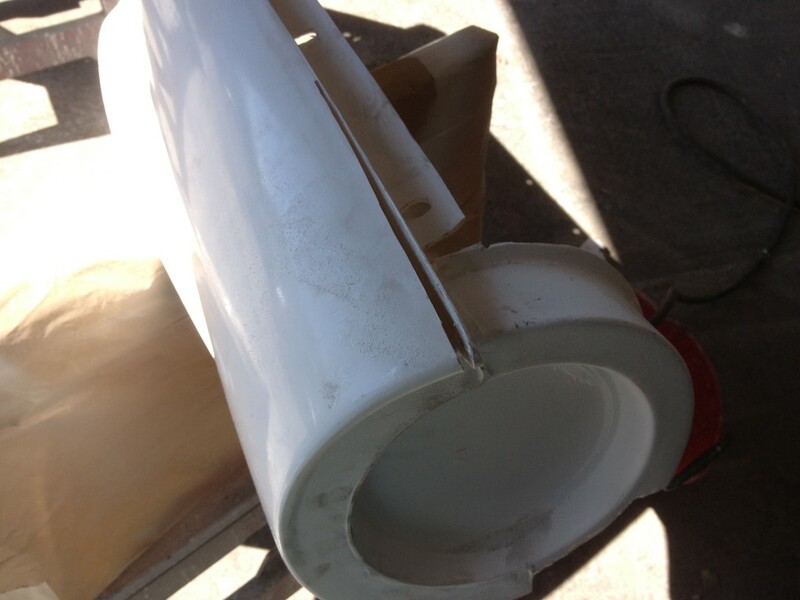 With these in place the Triumphs wing could be cut and re-fibreglassed to a more appropriate shape. As it turned out all the panels needed trimming and modifying to fit the car. Rear wings needed the reinforcing lips removing to allow them to sit far enough forward and to roll around the chassis sill panels. The front wings required the reinforcing lips also to be removed so as the doors would be able to open and also allow them to meet with the sill panels. 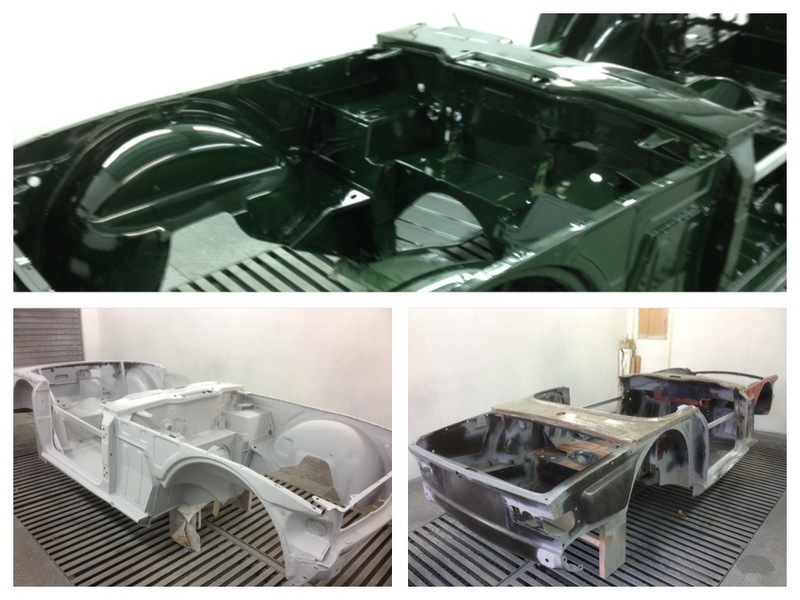 Once the body panel issues where solved and the aluminium doors surfaces where filed and shrunk we could now get the lovely chassis in to primer and then painted. 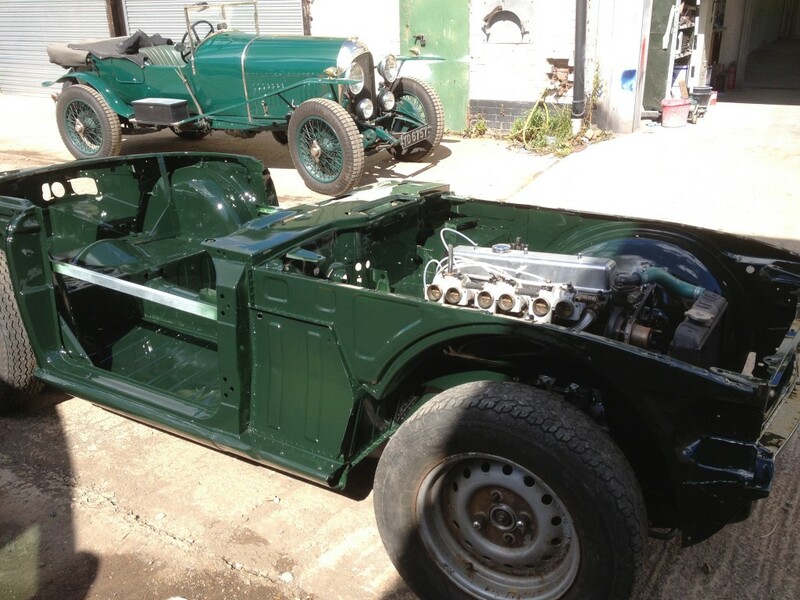 With the exception of some metal pitting and underseal that needed cleaning of the structural panel painting process went well and looked handsome in dark British Racing Green . All the panels where then prepared and mounted to the car for painting. Being a solid (non metallic) colour it was painted in direct gloss. 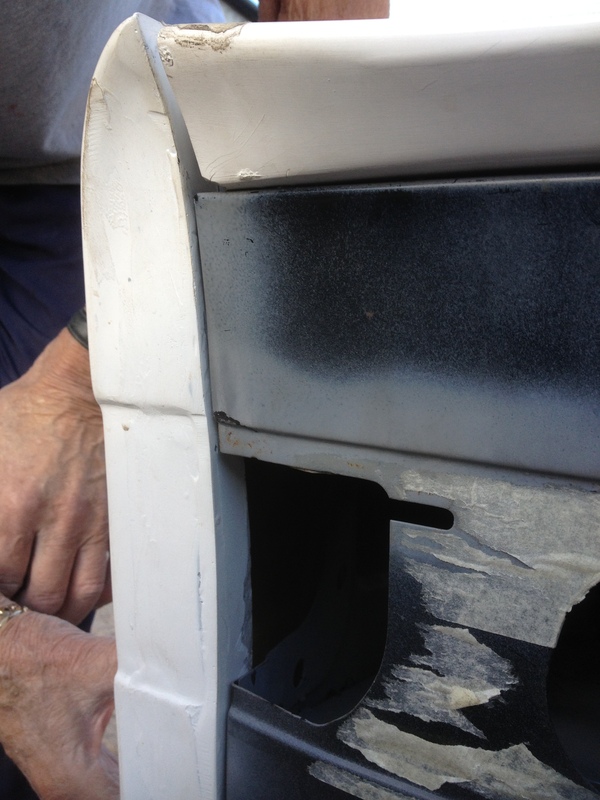 Below is a close up of the gun finish achieved on the panels. This entry was posted in Paint jobs and tagged fibreglass, GRP, paint job, respray, TR6, Triumph by The Paint Shop Pros. Bookmark the permalink.